Shopify Social Network Tabs : Shopify Social Network Tabs is an awesome application which will combine all your favorite social network profiles ,create their tabs and display them on front-end with a slider showing the tabs content. Shopify Social Network Tabs -Shopify Social Network Tabs is an awesome application which will combine all your favourite social network profiles ,create their tabs and display them on front-end with a slider showing the tabs content. This app helps in making your store socially equipped with platforms like Facebook / Twitter / Instagram / Youtube / Pinterest / Tumblr and many more. Provides different social networks with feeds. Displays latest posts of different social networks. 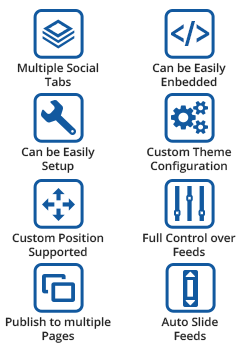 Provides you to set values for Social Networks,Styling and other settings like location,height,width etc. The block showing tabs and their slider will be displayed anywhere in frontend according to the location you set. Provides below given different social media tool access on one single tab. Admin can switches on/off the visibility of any social media tool. Admin sets the location which is only relevant for "slide out" tabs. This enables to select where the tabs will be located in the browser window. Admin decides about the CONTROL which when set to "on" a control bar will appear at the bottom of each tab when the user hovers over the content. Admin enters the Rotate Delay,which means to enter the number of seconds between each feed item. Admin decides the auto close which when set to "on" the "slide out" tabs will automatically close if the user clicks anywhere outside of the tabs. Admin can select the Background Color for each and every social media tool separately. 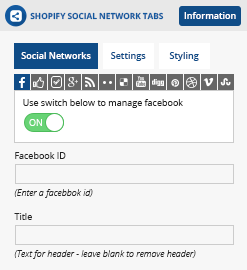 Did you buy Shopify Social Network Tabs?